There are few deep sky objects that are rarely matched to their impact through the eyepiece. When you first see them through the eyepiece, you lift your head for just one moment & think “Holy heck, did I just see that!”, and then rush back to the eyepiece . Not only is it a bright GC, but it is jam-packed with lines, arcs, loops, hollows and figures made up of stars. One particularly lovely alignment of stars seems to trace a large looping love heart shape. My sketch shows it on the left side of the main ball. Sketch was done in just over an hour. This GC is one big sucker. The mistiness that reaches out from the core is very expansive. The number of resolved stars is wicked. This GC’s reach was huge, even though transparency of the sky wasn’t brilliant. This is one target that I would really love to have a squiz at through a monster dob. I might even run the risk of trashing my night vision with it this way, J.
I can only hope that this sketch evokes some of the immense beauty of this cluster. It is just WOW! Media: White pastel, white charcoal pencil & white ink on A4 size black paper. 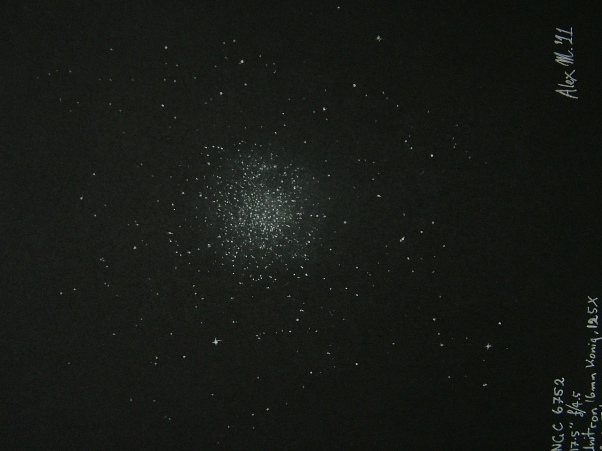 Superb capture and fine narrative of a stunning globular cluster. Terrific sketch, pretty realistic. Congratulations.